Santa bubble gum. 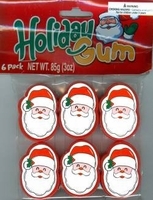 You get six containers of bubble gum, each container has a santa on them. These sweet treats make a great stocking filler. The bubble gum is in a roll similar to bubble tape and is great tasting too. We have many great stocking stuffer ideas. Lumps of coal, chocolate santa suckers, sugar filled candy canes along with all your favorite old fashioned Christmas candies.